Alocasia watsoniana - A Giant Jewel! Most of the Alocasia species that I consider to be "jewels" are small growers suitable for a windowsill or small conservatory. However, not all Jewel Alocasias are so diminutive! Read on to learn about this Giant of the Jewels . . .
Too Large for the Jewel Box! 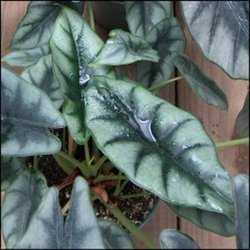 Plants such as the Little Queen (Alocasia reginula) are typical of those that I call the Jewel Alocasias. They are very pretty, small, and precious, just like jewels. In contrast, a few plants that, in terms of culture, qualify as jewels in the genus Alocasia are not small growers. 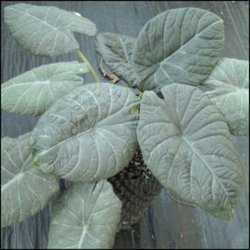 In fact, the plant that is the subject of this article can get large enough to be thought of as an "elephant ear" (EE), with leaves over 2 feet long. 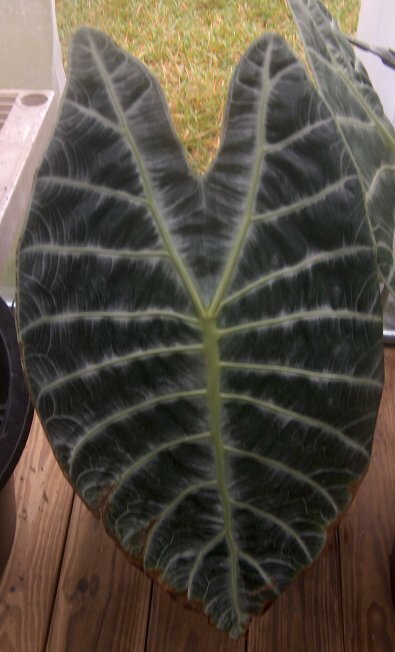 Alocasia watsoniana is related to some that grow smaller, such as A. sanderiana and a number of the plants in the longiloba/lowii group of Alocasias. Once this plant really gets growing, though, it outpaces and outsizes all the rest of the Jewels. 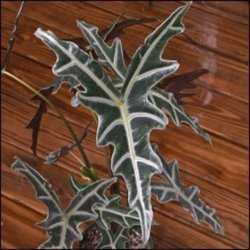 The leaves are like silvery-veined shields with very dark red-purple undersides. Like the other Jewels, this one shines best when temperatures are in the 80s F during the daytime, and low 70s F nighttime, with high humidity, bright light but not direct sun, and very well-draining soil. In past years, A. watsoniana was seen only in botanical gardens or private collections. Only in the relatively recent past has this plant become available through tissue culture (TC). I remember that my first chance to obtain pollen from one of these came only by borrowing the plant from a collector. Now I have two large ones in a small greenhouse, and a pot with smaller ones there, too. A. watsoniana, when well grown, is a stunning plant to see. Not only are the leaves very attractively colored, they are puckered in a unique circular manner between the main veins and around the petiole attachment area at the center of the leaf (see photo at left). I was very pleased when I observed that the inflorescences on this plant produce a nice amount of pollen. I wasted no time in attempting to cross this giant with the formidable Alocasia macrorrhizos 'Borneo Giant'. To my surprise and delight, the cross worked, yielding many fertile seeds. I knew I had something when I noted that a few of the seedlings had red undersides to the leaves. One can only imagine the excitement I felt at this knowledge, and the subsequent dread as well, when I discovered that some kind of pathogen had begun to kill off the seedlings. I tried desperately to save as many as I could, but to no avail. This was no failure, however, because I did learn that such a cross can work. I have since duplicated the cross, along with a host of others, in hopes I will get surviving progeny out of some of them. A. watsoniana is well worth the effort to obtain and grow. I do recommend that you review what I've written about the Jewel Alocasias here at Dave's Garden. In so doing, you will stand the best chance of getting your plant to survive and to reach the huge size of which it is capable.